Wood floor sanding is a bit of an exacting science. When it comes to a good flooring finish, professional sanding is an essential base upon which the finishing can be built. As with any other building project, if the base is wrong then the whole job looks botched. So because a good foundation is key to any quality wood floor restoration, it is wise to pay particular attention to the sanding process. Sanding can be either light or deep, depending upon the type of wood and its current condition. The best type of sander to use is one that leaves behind no residual dust particles in the air. This benefits allergy and asthmatic sufferers, as well as making the clear-up process easier. If you decide to try your hand at floor sanding yourself then remember not to leave the sander static as it can cause damage to the boards. 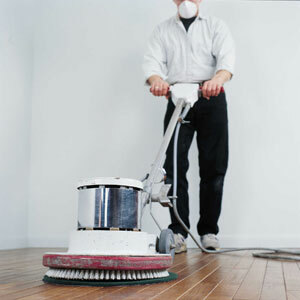 Keep the machine moving smoothly and evenly across the floor and use a hand sanding tool for corners and those difficult-to-reach spaces, such as behind radiators and vents. When sanding has been completed the floor boards should be uniformly smooth and a few shades lighter in colour. Make sure you have removed any protruding nails and tacks prior to sanding. You will also need to tackle any floorboard gaps, and boards that have become damaged must be replaced if the final result is to look perfect. After the sanding process has been completed it may show up small scratches or discoloration in places due simply to wear and tear. If this is the case then you should carry out the necessary repairs and re-sand. 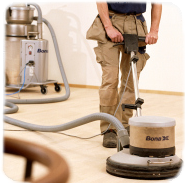 Because floor sanding is such an essential part of the wood restoration process it is advisable to leave it to a professional sanding company if there is any aspect of the sanding process of which you are unsure. A professional sanding may well be less expensive than you think, and it comes with the additional benefit of knowing your floor has been treated by wood floor specialists. Once the floor sanding process is complete, the floor is now ready for the finishing veneer of choice. Whether you choose woodstain, lacquer, oil or varnish you have the peace of mind knowing that a professional wood floor sanding company will always use quality non-toxic products in their adhesive, primer and sealant, so you and your family are protected from noxious fumes. If you are thinking of restoring attic wood flooring then once again it should be sanded before any finishing is put down. Attic wood is in the main, bare wood and may not have been touched since your home was built. If this is the case, you may wish to call in a floor sanding company for a free estimate before thinking of carrying out any work yourself. Floor sanding and renovation has come a long way in the last decade. So if you want the best for your floor then choose a wood floor company with generations of experience and the latest technology, specially designed to give the quickest, cleanest and most perfect wood floor sanding finish you can get. Your floor is precious to you and a well-maintained wood floor is the focal point of any room. So if you’re not a confident DIY’er then select a wood sanding company who loves your flooring as much as you do. Give your floor the best recipe for success and choose a professional sanding company to return your wood floor back to its former glory again.